Turn Any Desk Into Collaboration Center. 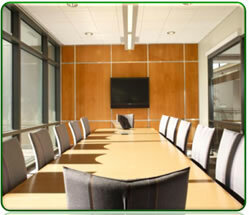 LAT-mDESK™ is a unique product that allows you to turn any conference room table into a collaboration center. LAT-mDESK™ is a drop-in device that allows multiple participants in a conference room to take control and/or share their individual computer screens. 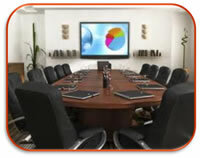 LAT-mDESK™ makes any simple meeting or conference room into a complete collaboration center. Collaboration is a hot-topic in libraries today because it allows the ability to leverage the dynamic of a group environment - to "crowd-source" ideas and provide a high-tech meeting atmosphere. Since mostly everyone has their own computing device, its not the device availability that is required, but an easy way to share the screen content. By installing LAT-mDESK™ into your meeting room, you immediately create a powerful collaboration center where multiple people can work on and share on common projects, while working at their own individual screens. Its simple, easy, professional and highly affordable. 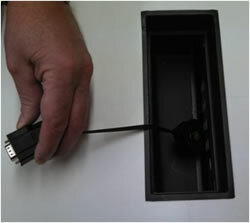 Drop-in LAT-mDESK™ into the center of any table. We provide on-site installation or you can do it yourself. Any collaborator can now project their screen on to a common display. Multiple control options are available via internal push-buttons. Aesthetically pleasing. That is, there are no ugly wires, cables, plugs...etc., to worry about, everything is neatly tucked away underneath the table. Full installation guides are provided.